Ubuntu has started to bore me lately. Nothing really new and exciting seems to be added to Feisty. And they just can’t seem to ditch the brown. I actually installed OpenSUSE before (I think it was 10.1) but I quickly went back to Ubuntu again. However, I can’t really remember why I didn’t like OpenSUSE so I’ll try it again. After reading about the progress of the new Gnome main menu, I don’t mind the hassle of installing it one more time. 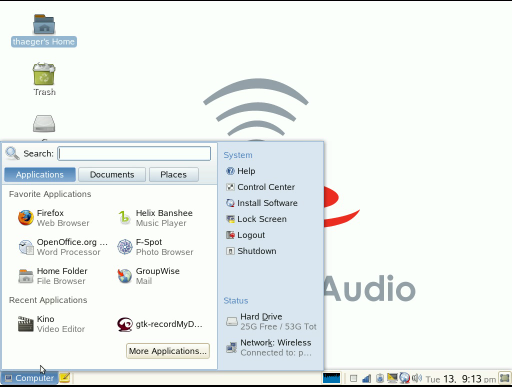 This entry was posted in gnome, Linux on 2007-03-04 by David Tenser. I’d love to hear about your experience, such as what things you like and what things you think the distro needs. Ted, I will definitely blog about the experience. Perhaps I’ll write an Ubuntu vs OpenSUSE article and submit it to OSNews as well. Torrent is a bit on the slow side for me, so I’ll probably not install it until Tuesday. Would be nice with an FTP link for the DVD .iso (could just find the CD .isos). Well, are you looking for pre-release 10.3, or current-release 10.2? Or, if you email (thaeger at novell) me a shipping address, I’ll get you an install of the 10.2 DVD.